60% of veterinarians aren’t using financial concepts to run their businesses, and many don’t review key metrics on a regular basis? Practices are typically missing charges in every surgery, equating to 5% of lost revenue? On average, 60% of patients have not been seen in the last 18 months? Just cutting expenses won’t necessarily lead to higher profits. Financially successful practices only have 2% lower costs than unsuccessful practices. Defining and measuring success for your veterinary business starts with measuring the things that influence its performance. This helps you identify the right areas for improvement and know when you've reached your goals. The new Sparkline Scorecard tracks over 40 Key Performance Indicators (KPIs) on a monthly basis to monitor processes and activities to boost revenue and profits. Sparkline works with your ImproMed software to display your data in an easy-to-read manner, with red and green symbols to show you what's working...and what's not. 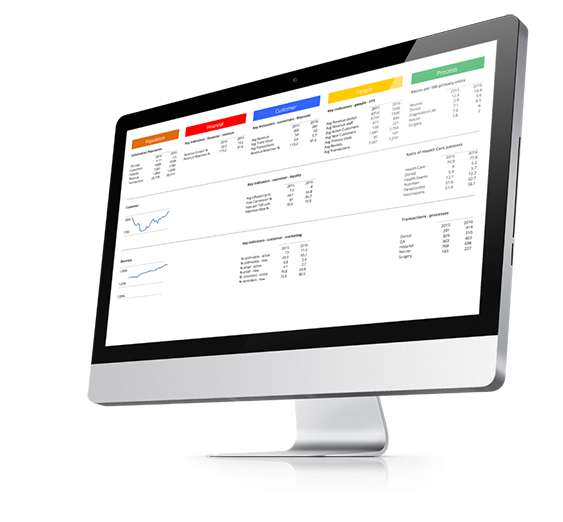 With Sparkline, you can easily identify results and trends in the business processes that generate your revenue. By isolating and analyzing these business processes, you can really understand what's affecting the growth of your business. Imagine having all of that information available at your fingertips!